If you're a gardener looking to grow a better garden, this book is for you. 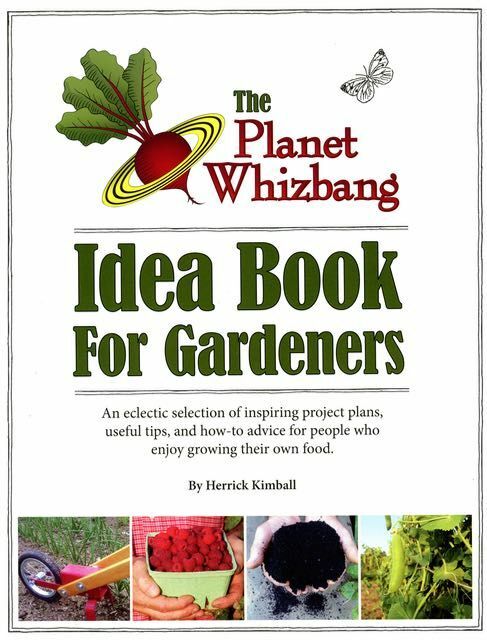 Herrick Kimball, inventor of the world-famous Whizbang chicken plucker, Whizbang cider press, Whizbang garden cart and Whizbang wheel hoe has packed the pages of this book with a diverse selection of whizbang ideas for gardeners. Many of the ideas are uniquely his own. Some ideas come from other imaginative gardeners. And scattered throughout are numerous idea-excerpts gleaned from the author's collection of 19th century almanacs and farmer's periodicals. When you're done reading this book, you'll be a smarter gardener, a more clever gardener, and a Whizzbang-Inspired gardener! The book has 124 pages and over 100 illustrations. List price for the paperback copy is $21.95. There is also a "secret" web site for readers of this book. The web site has lots of photos and more information related to many of the subjects covered in the book. Information about how to access the special web site is on the last page of the book. Click Here Now to learn lots more about this book.